On 11 December,2011, Kawasaki announced the Technical Hold off on 2011 Kawasaki Ninja ZX 10R, due to some internal engine component wear and tear under track riding conditions. In the mean while, who ever test rode the bike absolutely absolutely loved it. YouTube was flooded with video reviews of the bike. Then came the video that really showed the true prowess of this new Green Maniac. The stock bike went above the 300 kmph mark!! Having so many rave reviews to backup, the Hold Off did come as a shock to many. To add spice to the recipe, Kawasaki was tight lipped at the actual technical snag in the engine which was the root cause of the hold off. Existing owners of the bike were being asked to bring their units back to the dealer and they would be served on a priority basis once the technical snag was rectified. It was all haze until yesterday when Kawasaki made a press release mentioning the actual root cause of the Hold Off and mentioned that the hold would lifted off late January. 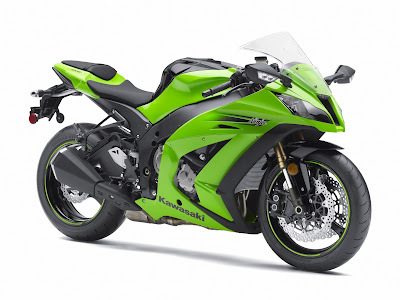 Kawasaki Motors Corp., U.S.A. today announced that the recent sales hold placed on the 2011 Ninja ZX-10R sportbike is expected to be lifted in late January and that sales of the highly-anticipated unit will resume as normal. According to Kawasaki engineers, the proactive sales hold resulted from a finding that indicated possible surging of the intake valve spring when the unit is operated under unique riding conditions, such as on a racetrack. The surge could cause the intake valve to seat improperly, resulting in poor engine performance. The camshaft, valve springs, and spring retainers are being replaced to prevent the valves from surging, without affecting engine performance. This is a very good news for all Kawasaki fans as the 2011 Kawasaki ZX 10R is being looked upon as the bike to compete with in 2011 and is being seen as a serious contender for the current king, the BMW S1000RR. It's good to see that Kawasaki is backing up it's flagship with such aggression.